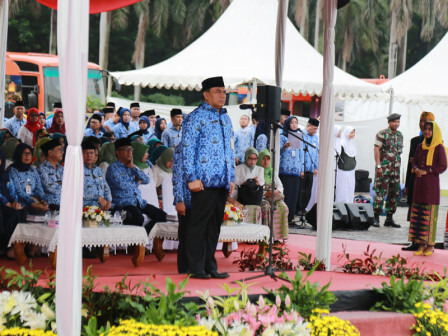 " We will continue to enhance the role of women on all fronts and sectors"
City Secretary (Sekda), Saefullah, led the 90th Mother's Day at the Silang Monas Selatan Field, Gambir, Central Jakarta. The ceremony with the theme "Together to Increase Women and Men in Developing Family Resilience for Nation Welfare" was followed by hundreds of participants starting from Jakarta state civil apparatuses (ASN), PKK cadres, Dharma Wanita members, and representatives of Regional Leader Coordinating Forum (Forkopimda). He expressed that the role of women in the ranks of Jakarta Provincial Government every year is always developing and has bright prospects. "We will continue to enhance the role of women on all fronts and sectors," he expressed, Wednesday (12/26). In future, the quantity of women under echelon positions, either SKPD or UKPD would continue to be improved. Even, the city would also encourage important positions in BUMD that can also be filled by women. "Hopefully, starting from echelon I, II, and III, the percentage of women reached 30 percent," he h oped.